The driver of the Toyota was transported to Livingston Memorial Hospital. Two 18 Wheelers Lose Control on 59 One Slams Car, GOODRICH, August 19, 2008 - Slick roads from drizzly weather apparently caused a three vehicle accident on U.S. 59 at 1988 in Goodrich. 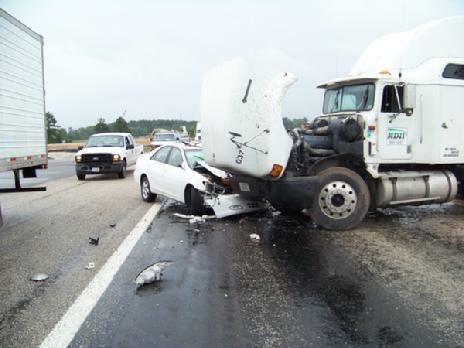 At approximately 2:05 pm on August 19, 2008 an 18 wheeler with Texan Transporter Service out of Houston and driven by Bernard Leffyear, 39, of Houston was south-bound on 59 when, according to Leffyear, the slick roads caused his tractor trailer to start fish tailing. Coming up behind Leffyear was another 18 wheeler driven by Raul Vega, 50, driving for Mason Dixon Intermodal, Inc. out of Edinburg, Texas. Vega, in an effort to avoid hitting Leffyear began braking and at which point his rig began to slide on the slick roads. Leffyear's trailer slid sideways and pulled him and his passenger backwards to the west side of 59 and down into a drainage area, while Vega's tractor trailer plowed through the median on the east side of 59 and partially onto the north bound side of 59 where his truck collided with a white 2002 Toyota Camry driven by Allen Berger, 60, of The Woodlands, Texas. DPS Troopers Kevin Burman, David Morris, and Chris Stanbery were dispatched to the scene. Berger was transported to Livingston Memorial Hospital by Americare Ambulance Service with non-life-threatening injuries. Officials from the Texas Department of Transportation were also dispatched to the scene, also at the scene was Polk County Emergency Management Coordinator, Kenneth Hambrick. One lane of 59 South was blocked during the clean up and investigation while two lanes of 59 North were blocked and traffic diverted to the shoulder. Leffyear's truck was towed by a heavy duty wrecker from East Texas Towing while Vega's truck was towed by a heavy duty wrecker from 24 Hour Wrecker & Road Service. The Toyota Camry was towed by Harwood Wrecker Service and will be stored at Harwood Wrecker Service in Livingston. No citations have yet been issued as the road conditions may be to blame for the accident. The scene was cleared and traffic fully flowing shortly after 4 pm.